Rear Admiral, Teacher, Mathematician, Programmer. For my column this month I want to tell you about an amazing woman who laid the foundation for the career I have today. Born this day in 1906, Grace Hopper was an accomplished woman who invented some of the core features and tools of modern computer programming. The field would not be the same today without her work. As a programmer myself, it amazes me what she was able to accomplish. Of course she was part of a team, not toiling away by herself in some dark room, however that fact makes it even more impressive that she is so clearly credited for her work in a time when women’s accomplishments were so often obscured. She is credited with inventing the compiler, a program that translates written instructions into code that computers read directly. She also was key to inventing COBOL (and FORTRAN) a new kind of programming language that allows programmers to write their code using words instead of only numbers. The modern web would likely not exist without this development. These languages influenced the hundreds of languages that came after it. 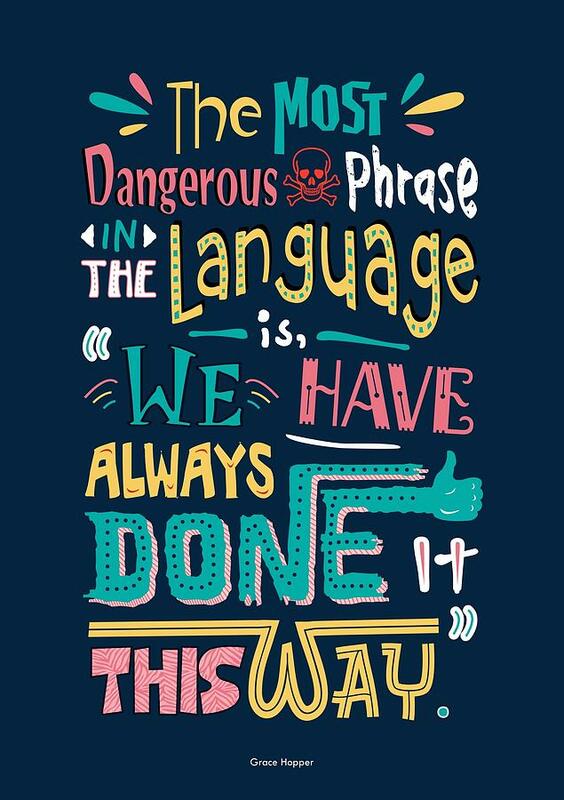 If you have ever heard a programmer talk about “debugging” a bit of code, you can thank Grace Hopper for coining the term. A moth was trapped in a relay of the Mark II computer she was working on and she described its discovery and removal as “debugging” the machine. She is sometimes called “Amazing Grace” for all her accomplishments, though she would say her biggest accomplishment was helping young people learn. She was an avid teacher and took joy in challenging those around her to think beyond the ways they had always done things. She even had a clock in her office that ran counter-clockwise as a reminder to look at problems in new ways. For all that, in this month of crone celebration here at LSQ, I find one of her most interesting traits is the age she started her programming career. Born in 1906, she did not join the Navy until she was 38 and it was only then that she began programming. She brought along her childhood curiosity for taking things apart and rebuilding them and her love of mathematics. Combined with her life experience, this meant Admiral Hopper was well-suited to bring new innovation to the burgeoning field of computer programming. Throughout her life, she continued to buck traditions and expectations. She remained active in the Navy Reserve for 42 years, much of that by special permission of Congress that allowed her to serve well past the mandatory retirement date. After retirement she returned to teaching, her first love, and continued to inspire students until her passing in 1992. 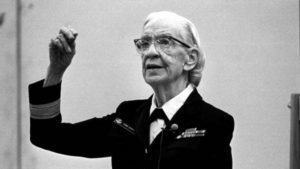 Grace Hopper left behind a legacy of innovation and inspiration. Her work garnered her the Defense Distinguished Service Medal, the highest decoration given to those who did not participate in combat, along with a posthumous Presidential Medal of Freedom.